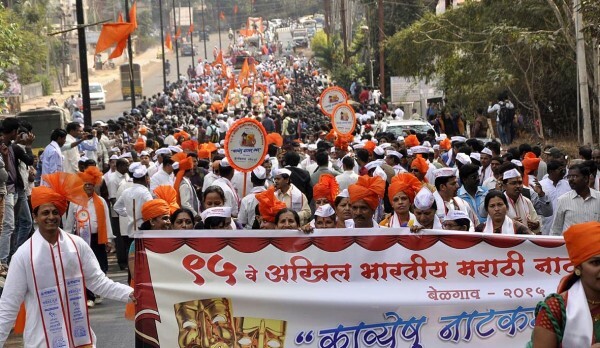 The 95th Akhil Bharteeya Natya Sammelan (Marathi theatre convention) began on a grand note with the Natya Dindi (procession) which began from Margai temple Bhandur galli and culminated at CpEd grounds the main venue of the Event. Faiyazz Sheikh, in her presidential speech, expressed concern over loosing charm of theatre especially children’s theatre while addressing the gathering. Former union Minister Sharad Pawar, also spoke on the occasion. Maharashtra CM Devendra Fadanvis arrived in the city at about 7 pm and he too will participate in the events. Hundreds of actors gathered for the event and citizens were enthralled to see them in person like Mohan Aghashe, Alka Kubal, Vandana Gupte, Pushkar Shotri to name a few. Vandana Gupte was awarded the Gogte Foundation’s Life time achievement award. Can any one tell me which naandi or song was being sung as the Palakhi of Natya Dindi entered the Sammelan premises? Missing being there as a theatre enthusiast.